I remember, fairly clearly, September 11, 2001. I was in 8th grade, sitting in (I think) Latin class. The teacher told us that there were reports of an airplane hitting the World Trade Center in New York. I also remember that my brother was flying out of New York that same morning. Up to that point in my life, I had seen things on the news with people in some place on the opposite side of the world burning American flags and doing other things showing their discontent with the way my country managed its affairs globally. However, not once had I given it a second thought. As the day progressed, the Head Master of my school pulled the entire school into the auditorium to tell us that two airliners had crashed into the twin towers in NYC, another had hit the Pentagon, and another had crashed. Details were sketchy, but it was certain that it had been intentional and no minor thing. Even then, I didn’t understand that this one day would alter many things in my life for the foreseeable future. At that time, I had almost no understanding of Islam, the Middle East, Central Asia, or anything about the politics there. It just so happened, that our next section in my Medieval History class was on the history of Islam and much of the Middle East. Armed with that basic understanding, I began the journey to where I am today. A few days ago marked my second 9/11 in Ktown. And, surprisingly, I was in a city that was engulfed in gunfire, tracer rounds, and frantic shouts. However, these were not the sounds of battle, they were the sounds of celebration. 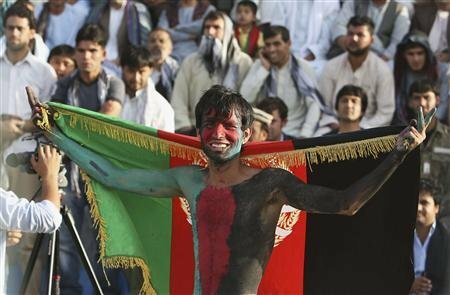 Afghanistan, that day, had one the South Asia Soccer Championship, defeating India 2-0. While I don’t altogether approve of the methods of celebration, it struck me as to how far this country has come. This is the first major win for Afghan football in 50 years. If it wouldn’t have been dangerous to leave the compound, I would have joined in. I’m happy for the win in football, but I’m happier to see how far things have come. Many people think that the US and NATO have wasted their blood and treasure here. Not so. I could talk all about the virtues of the Afghan people but I’ve done that in other places. The battle is far from over here, but I think it’s going better than most people know. This past 9/11 stands out in stark contrast to the others that I’ve experienced. While, yes, a little scary, I’m blessed to have been here during this time. I saw a people getting up off its knees, people dusting off the past and moving on. I hope it can be sustained. While, even after 2014 has come and gone, Afghanistan will still be one of the least developed countries in the world, the possibilities of this place are endless. If this place could know a generation of peace, the progress would be unbelievable. This is a lot to hope for, I know. But where’s the harm in hoping? I get to see the hope of this place every day here in my job. I get to see good and valuable things (things worth more than money) passed to the future of this country from my own in the forms of knowledge, character, and virtues. Don’t give up on this place. Even today, bad news streams out of this place. More attacks, more people getting killed senselessly, more suicide bombs, more RPGs; more calamity, more discord, more bloodshed. You won’t hear about the students that graduated with honors from our school here. You won’t hear about the Afghan man who started an advertising business and is now one of the biggest advertisers in Kabul, you won’t hear about the woman who has overcome tremendous obstacles and founded orphanages in Afghanistan, you won’t hear about the multitudes of good things happening here.